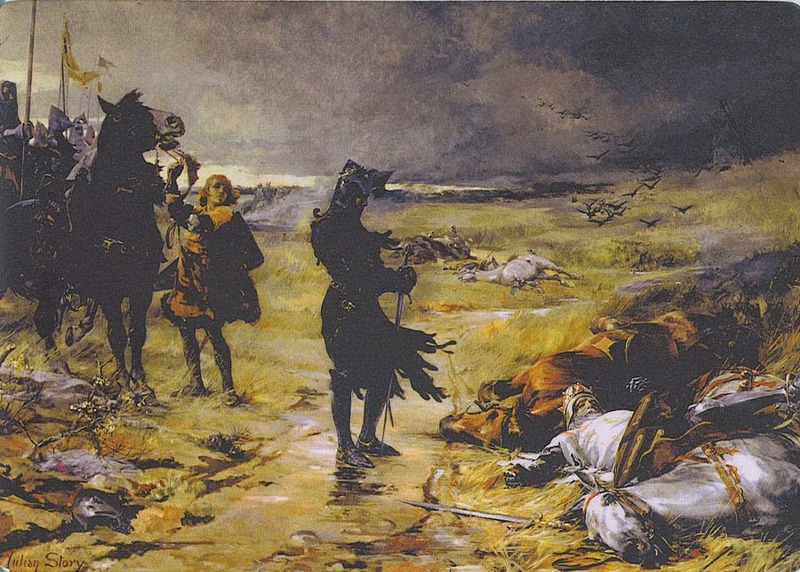 Black Prince at the battle of Crecy by the British painter Julian Russell Story (1857-1919). After the battle the victorious English prince is contemplating the body of the dead King John of Bohemia. It should be mentioned that Edward Prince of Wales the eldest son of King Edward III of England was never called “Black” in his lifetime. It's an attribution of the 16th century. But anyway he looks nice so deadly black with the crows in the back. Love how the dark brooding atmosphere, the restlessness of the horse, and the stiff wind all combine to seemingly reflect the nature of the Prince himself. It's indeed a beautiful painting. But the whole "brooding atmosphere" is pure 19th century romanticism and has nothing to do with the Prince himself. well, perhaps there is something in my comment of the viewer perceiving something that the artist never intended, but that is one of the pleasures of art.